Checking saddle fit is always started with the bare saddle, no pad. If you are looking at a flat panel saddle, you can essentially do a bare tree fitting by removing the covers over the panels. Before you set the saddle on the horse, check the “health” of the saddle. There should be no obvious protuberances, tears or misalignment in the tree or attached leather. Looking at the bottom of the saddle can often show problems in construction that don’t show from the top. Run your hand along the panels on both sides, first feeling for any problems with the material. Next, move slower and press down with your hand, feeling the shape of what will touch the horse. I have checked out a number of western saddles that once your press your hand in the fleece you realize that the shape of the tree couldn’t possibly match that of any sound horse. Also, if you are looking at an OrthoFlex or similar brand, press your hand over the mounting positions of the panel to the tree. An older saddle may have worn through the covering and the mounting hardware can come into contact with your horse! As you walk to your horse, who should be standing on level ground, first make a mental note of any conformation points that can affect saddle position. These include, but are not limited to: forward girth groove, very laid back shoulder, downhill, uphill, short back, large powerful hind quarters. Before selecting a saddle, you should have already considered conformation points such the breadth and angle of the shoulder (which should be considered separately! ), wither height, curvature of the back and length of back. Place the saddle forward over the withers and then slide it back, kind of rocking it from side to side. Stop when the saddle seems to find a seat. Look at the position it landed in and repeat this a couple times. It should be roughly the same. This is the position that your horse’s standing conformation dictates the saddle will want to sit. We’re not done here though! Next, stand back and look at your horse with the saddle in place and the position of the billets compared to the girth groove. If you have long billets this is easy, but if they are short, have someone raise the flaps and if it is a western saddle, draw a mental line from the latigo ring to the horse’s girth groove. Look at the line the billets hang – do they aim toward the horses girth groove? Is the mental line on your western saddle close to straight down, or angling sharply forward? This mare has a very laid back shoulder (gorgeous!) and a forward girth groove. I have another picture of her with a dressage saddle and the saddle is right up over her shoulders. Definitely a crupper and breast collar candidate! And you wouldn't want to overly tighten the girth as that would pull the saddle into the withers. This is your first clue about what may happen to the position of the saddle when the horse moves. A forward girth groove, especially on a horse with a laid back shoulder will likely try to pull the saddle forward. This is not to say that a laid back shoulder is not a desirable conformational aspect, just that at some point it can have an effect on saddle fit. For treeless and flat panel saddles, you may quickly realize you need a crupper. This does NOT mean the saddle doesn’t fit, just that you aren’t banging into the horse’s shoulder motion to stop the saddle from moving – which is a good thing! You’ll know after a couple rides if you need a crupper. For rigid tree saddles, you may still need a crupper. But you cannot rely solely on a couple test rides to make this determination. It’s possible the saddle won’t move much, depending upon the extent of shoulder rotation or bulk of shoulder. What this means is that it might not be a good fit keeping the saddle from moving forward – it is the horse’s shoulder, painfully! One symptom of this problem is a shortened stride. 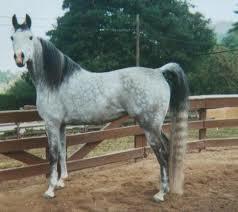 Some horses may develop white hairs, but this takes time, often not until the hair coat changes. If you've made several saddle changes, you may not know which saddle (or pad) caused the white hairs. The ultimate damage shows up with loss of musculature behind the shoulder. Sadly, there are saddle manufacturers who design a bulge in the tree to fit into that pocket, knowing many people think if the saddle stays in place, it must fit. This bulge creates pressure, changes the horses motion, allows muscles to wither and creates an artificial pocket behind the shoulder. The saddle falls into the dip, causing more pressure. In general, the front of the tree should rest a couple inches behind the point of the shoulder when the horse is standing. What happens when the horse moves? As the leg extends forward, the shoulder moves back. If it runs into the tree, the horse will alter their way of going to avoid pain. To check this possibility, have someone lift a leg and watch how the point of the shoulder moves in relation to the saddle. Another method is to put a hand under the front of the saddle and carefully walk the horse forward, feeling for this conflict. Some horses have bulky shoulders and extreme shape changes when moving. For them, these tests are critical to perform. A good solution can be a panel or treeless saddle, but still be careful. Some of the panel saddles have a single mounting point at the front of the saddle and a big shoulder action can change the angle of the panel, driving it into the spinal processes along the wither. At a competitive trail ride, a woman told me her daughter's horse ended the ride with a sore back. Sore didn't begin to describe the problem. A simple caress brought the horse to his knees. The rider was young, maybe 8 and probably didn't weigh 50 pounds. Tiny english saddle which upon first inspection fit perfectly. But when I asked the woman to place the saddle, she put it a bit forward, which is unfortunately typical. When the horse moved, a large bulge lifted the saddle, driving the rider weight into the center of his back.